This week is one of Slime’s most favorite of the year. Why you ask? Because it is National Tire Safety Week! Maybe not quite as exciting as Shark Week, but it is the one time of the year that focuses on a topic near and dear to our hearts: Tire care. Tires are the only part of the vehicle that touches the road, making them a vital contributor to travel safety. 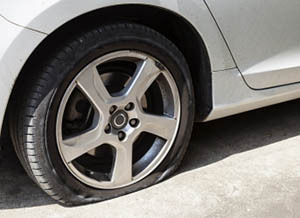 According to the National Automobile Dealers Association (NADA), underinflation is a tire’s No. 1 enemy, causing damage that may lead to tire failure and even an accident. Underinflated tires are also less fuel efficient, costing you precious dollars at the pump. The DMV has found that by keeping your tires inflated to the proper pressure, you could save yourself up to 3 percent in gas mileage. Overinflation is just as worrisome, leading to uneven wear and handling or stopping problems. The solution? Check your tire pressure on a monthly basis (including the spare). In celebration of National Tire Safety Week, here are our top tips to help you correctly check and maintain your tire pressure. Tip No. 1: Purchase a tire gauge and keep it handy in your vehicle at all times. We like this digital tire gauge: braided hose, easy to use and includes a pressure release button. Tip No. 2: Understand the correct tire pressure for your car. Do not inflate your tires according to the maximum PSI (pounds per square inch) listed on the sidewall of your tire. The proper air pressure, based on the weight of your car and the tire size, can be found on a sticker placed on the driver’s side door jamb, or in your owner’s manual. Tip No. 3: Driving heats up your tires, making tire pressure readings inaccurate. Be sure to check pressure when the tires have sat for more than three hours. If you have a spare tire, check it too. Tip No. 4: Don’t be shy with your gauge. Be sure to push the pressure gauge down firmly on the valve stem of your tire to get an accurate reading. Tip No. 5: Use an inflator with Inflate-Right technology when filling up your tires. Inflation is easier and faster when you can preset the correct pressure in your inflator, then turn it on and forget it. The inflator automatically shuts off when the set pressure is reached. Tip No. 6: If you accidentally overinflate a tire, most tire gauges have bleeder valves to help release the extra air. Tip No. 7: Accidents still happen, regardless of how well you maintain your tires. Be prepared with a can of Quick Spair in your trunk in case of an emergency. Forget pulling out the jack and the spare tire -- Quick Spair instantly sends a mixture of sealant and compressed air into your tires to seal up any punctures to get you back on the road quickly and safely. Maintaining correct tire pressure improves your fuel consumption, gives you better control of your vehicle, prevents uneven wear and can extend the life of your tires by thousands of miles. In observation of National Tire Safety Week, get out there and check your tire pressure today! Does Slime plug the valve stem? or a pressure gauge when taking a reading after Slime has been used in the tire? I have slime tire pressure gauge, and the numbering use on it is not making clear on if you have the correct air pressure in your tires. For one the numbering starts at zero, the next there ten notches which it doesn’t indicate if they ones, or fives or ten which makes it hard to tell what pressure in your tires. That make me ask this question. Thanks for any help.